Robert Bekkers plays a 2005 Jeroen Hilhorst concert guitar, custom-made for the duo. The PIANO and GUITAR, two of the most popular instruments, once accompanied each other in 19th century chamber music. Nowadays it is a rare but special occasion to see this unusual combination in the classical music scene. 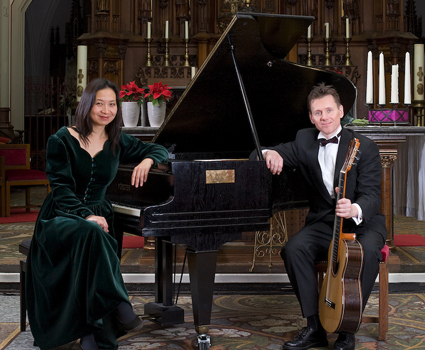 Anne Ku and Robert Bekkers formed their PIANO GUITAR DUO in 2001, reviving this almost forgotten tradition of music making. This once favourite pastime of bringing together performers, composers and enthusiastic audiences has left a largely untapped legacy of published music specifically written for the piano and guitar. Using modern instruments, the duo has rekindled music from earlier periods. Just as importantly, Ku and Bekkers’ performances are encouraging contemporary composers to write for this deserving combination. Their collaboration has already inspired original music for piano and guitar, expanding the existing repertoire with exciting new possibilities. The duo also arranges famous works like Bach's Badinerie, Vivaldi's Four Seasons, Mozart's Eine Kleine Nachtmusik, Handel's Arrival of the Queen of Sheba, and Chopin's 1st Piano Concerto for themselves. They are eager to take their growing repertoire to new audiences everywhere. The husband-wife team was interviewed on Houston Public Radio KUHF of their five-week America Tour 2010 with a preview of their forthcoming CD Winter featuring their own arrangements and adaptations for piano and guitar plus original works such as the Grand Potpourri National. The tour ended in Maui, Hawaii, where the pair has since taken "sabbatical" with Anne in Maui and Robert in Boston pursuing his doctorate at the New England Conservatory (expected 2015). They released their first CD Summer! in 2010 after a new venture of collaborating with visual artists in Bruges, Belgium and elsewhere. The 70-minute CD contains Bekkers' arrangement of Vivaldi's Summer and Romanza from Mozart's Eine Kleine Nacht Musik, together with their 2009 programme. In 2009, the duo toured Spain with their popular three-century programme and a new contemporary programme premiering new works of Dutch composers Gijs van Dijk and Heleen Verleur, and English composer David Harvey. The new programme of 21st century music for piano and guitar was repeated on 12 July 2009 in the presence of the three of the composers in Amsterdam. In 2007-2008, they collaborated with the Korean violinist Naeon Kim in trio music of modern American and Dutch composers. Ku and Bekkers have performed in London, North Cyprus, Cape Town, Italy, Belgium, Spain and throughout the Netherlands. Their first visit to the USA in December 2007 included two house concerts in Houston and a live radio appearance on Houston Public Radio followed by live radio broadcast on Manao Radio Wailuku and a sponsored public concert in Maui, Hawaii. In June 2006, the duo launched the Monument House Concert Series in Utrecht, Netherlands bridging the gap between the professional music world and local communities.